Life is busy. Unfortunately it's the way things work in our current society. We have a hard time slowing down to sleep much less read our bible and connect with Jesus. 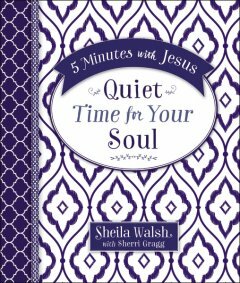 The 5 Minutes with Jesus series from Sheila Walsh seems like it's written to fix the fact that we just don't have the time. I am new to the series and Quite Time for Your Soul is a new book for me. The format is wonderful as there is a small devotional reading with moment from Walsh's life that work up towards a small less and teaching. She them relates them to a part of scripture that can help illustrate her point behind her personal story. At the end of the small devotional she has listed a few scriptures that you can read to spend your 5 minutes with Jesus. When she says 5 minutes she truly means it. The devotionals only too a few minutes and then reading the scriptures add a couple of extra minutes. I liked the idea of having this small book to drop in my purse and read on the go, but I don't think this would be a great book for in-depth study, obviously. I think this has a lot of potential in that you could use her story and the final verses to help spark a journal entry or you could cross reference the verses for some more in depth study. I don't think this book is good for someone who wants to really dig deep into God's word and connect with Him that way. Overall, this was an ok book. Would I probably get the others in the series, no, but it's nice for a quick devotional on the go.